In my last two posts I have been drying leaves from my garden for use in potpourri and then adding essential oils to the potpourri for added fragrance. Here is the finished potpourri recipe. 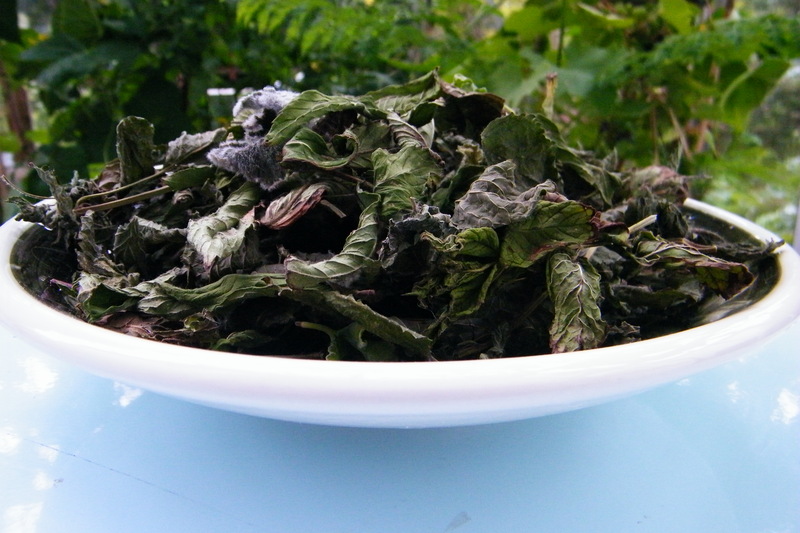 This dried leaf potpourri is not as pretty as a dried flower one but has a gorgeous fragrance. I used lemon balm, peppermint and scented leaf pelargonium. In aromatherapy terms, this combination of these dried leaves should pack quite a punch, as scented leaf pelargoniums are said to be uplifting, lemon balm gives an emotional boost, and peppermint is revitalising. 1 litre fresh herb leaves. A basket to dry them in (air circulates through the holes). A few drops of essential oil. I used melissa (lemon balm), rose geranium and peppermint. 1. 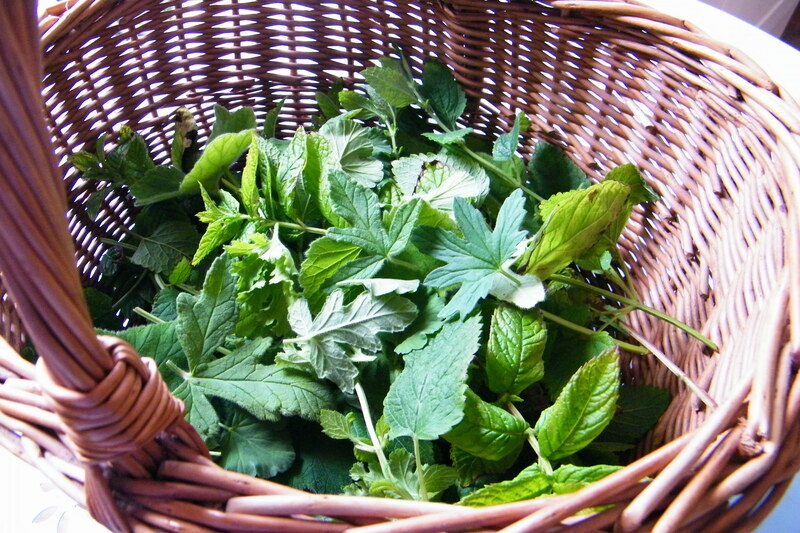 Put the basket in the airing cupboard (or somewhere warm and dry – a garage will do in summer months) and stir the leaves around after a few days to encourage them to dry evenly. The lemon balm and peppermint will probably be fully dry in about a week, but the pelargoniums may take a bit longer because of the moisture-retaining hairs on the leaves. 2. Break the dried leaves up a bit to release more fragrance as potpourri. 3. 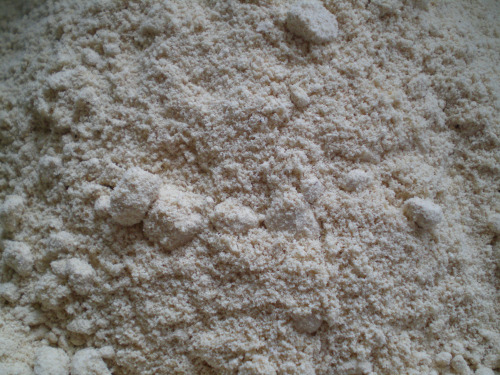 Take a teaspoon of orris root powder (this stops the essential oils evaporating) and drip the oil onto it. 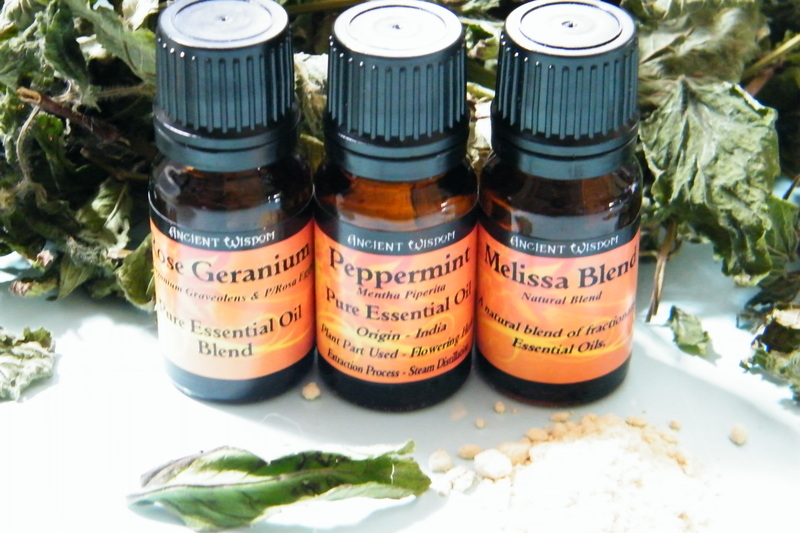 For 1 litre of dried leaves I added 3 drops rose geranium oil, 3 drops melissa (lemon balm) oil and 2 drops peppermint. 4. Sprinkle the orris root/oil mixture over the leaves. 5. 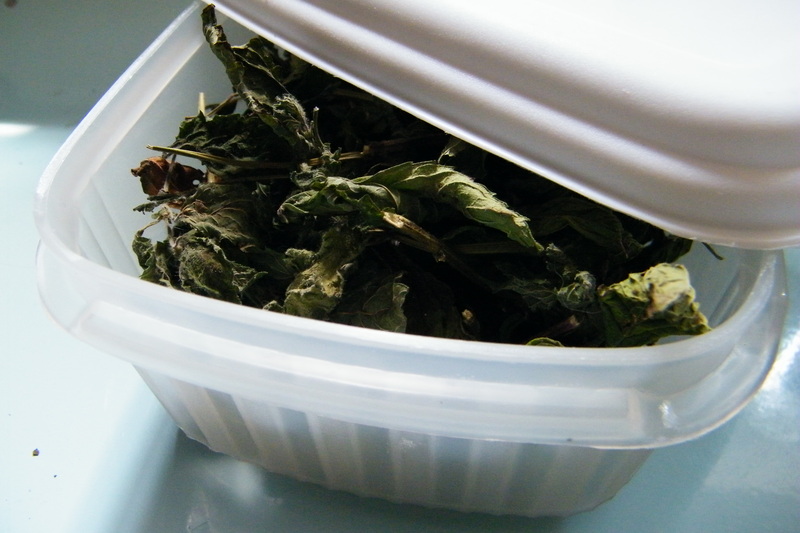 Seal in tupperware, shake gently to disperse the ingredients and leave for as long as you can for the fragrance to mature (a minimum of 10 days, up to 6 weeks). Shake from time to time to mix. Haven’t got the time to dry the herbs? Dry in a fan oven at 30degC or the lowest setting for a few hours. Haven’t got time to wait for the potpourri to mature? Try a) using fragrance oils instead – in which case you can omit the orris root powder – just shake the oils with the dried leaves in the container and leave for a few hours to permeate before displaying. The resulting potpourri will have a good fragrance but less aromatherapy value. Or b) Omit sealing the dried leaves in tupperware with the orris root powder and just display the leaves in a bowl as soon as they’re dry, adding a drop or two of essential oil from time to time. This will use a lot more oil as it will evaporate quickly, but smell gorgeous. Haven’t got these herbs? Try rosemary, thyme, marjoram, citrus peel, clary sage, lavender leaves, verbena leaves, or artemisia, and matching oils. For more general hints and tips, see my blog post about potpourri making. Fragrance oils from 99p a bottle.